It all began a few years ago, while starting at my DVD shelf and thinking about Abraham-Hicks' quote to 'reach for the better-feeling thought'. That's when I first had the with the idea of creating a list of films that had made me feel better. After a long period of intensive research to find films that had helped other people the 50 Feel-better Films emerged. Why stop there? A natural extension was a similar book on songs, 50 Feel-better Songs from Film and TV. From there sprouted, 25 Feel-better Free Downloads, a short book of films, songs, poems, images and books that are in the public domain and so accessible to everyone. Films are made by the Entertainment Industry and so are, first and foremost, for amusement and enjoyment. However, some of the vast output has a restorative effect; stories written from personal experience or understanding of situations that level lives as with a baseball bat. From the cellar of despair, you might say that these are just fairy tales but all of them, without exception, are based on real life. These things happened to people who were pushed, fell, searched, or allowed themselves into new beginnings that developed into outcomes that equaled, or were even far better than, the relationships, careers or homes they lost. 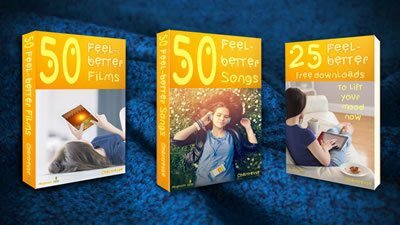 50 Feel-better Films is a book that assembles a list is a hand-picked choice, of the films that have, at least, a mood-lifting effect. There are no fixes of what is broken, only new and improved. There are no deaths of subsidiary characters we have grown attached to, there is no wistful sadness, there is only hope and fulfilment and happiness at the ending of each of these stories. As to the title, ‘Feel-better’, at the bottom of the emotional staircase you may not be ready even for the inspirational and motivational and so, although these films are also those things, this list is designed simply to include something to make you feel better, even if it’s just a little. For those who are happy and want to feel even happier, this is also a compilation for you. The list is now complete but if you have any ideas to supplement the collection please email Chartreuse@heypressto.com or leave a comment on the Heypressto Facebook page.